This is one of the many novelty releases from Carlton Ware designed by Roger Michell (Lustre Pottery) for the Company. 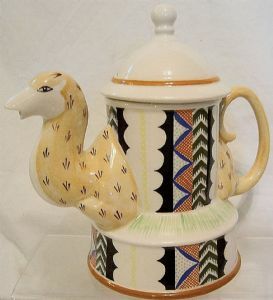 The original design of the Camel was designed, thrown and turned by Roger with decorations by Danka Napiorkowska in 1974. Printed on the base of one foot is the appropriate backstamp indicating a date of 1978. The overall height to the top of the finial is approx 8 inches (20 cms) and is in perfect condition with just a little crazing.